Corey told of how the priestess gave him the Inner-Earth version of the history of the solar system, and the colonization of Earth. She told of a race called the “Guardians” (who were actually the sphere beings that recently returned to the solar system). These beings were the ancient builder race who inhabited the solar system billions of years ago. According to the Inner Earth accounts. the civilization they built was extremely advance. So much so that no other race dared come near to this system for fear of retaliation, as their defenses were completely capable of wiping out any threat. These were also the beings that the SSP called the “Ancient Builder Race”. This Guardian race was also said to be the same race that built the Giza pyramids several billion years ago. The story went that these beings had an extremely advance society in this system during that time, and they eventually left this frequency to a attain a higher one. Though when they did, their barrier and defense system remained active. According to Goode, if I understood correctly, there were those of this race who remained in this system and began to fight one another in a civil war between those on a planet and those on the planet's moon, during which the planet was destroyed. The planet was called “Tiamat” (also known as Maldec). This is congruent with David Wilcock's research and working hypothesis that Mars was once the moon of a super-Earth type of planet that was destroyed. The priestess continued. The war destroyed both planets, creating the asteroid belt and sending the moon out into an independent, solar orbit. (This moon would become Mars.) This also caused an influx of refugees to planet Earth. When this disaster occurred, it took down the outer defenses of the solar system, and as this happened, it sent a signal out into the galaxy like a beacon, which attracted all of the races that were avoiding this system beforehand. After these defenses went down, all of these groups had free rein. This beacon also brought what are referred to as the “genetic farmers” in, who brought more survivors of this disaster to Earth, and who also performed experiments of every kind upon these people. The priestess told about how when the Guardians returned, everything changed. This is in reference to the recent return of these spheres to our solar system. She told of how the Inner Earth people wanted an audience with these Guardians, but the Guardians did not respond to communication (the same as when the SSP was ignored when they tried to contact them). This was not at all typical, as the Inner Earth people were used to communicated with these beings telepathically, but at this point, they simply ignored the Inner Earthers' requests for communication. Corey mentioned how he told the priestess of how he believed that some groups who had secret agendas were some percentage service to self. This confused her . She said that these Sphere beings/Guardians would have to be considered partially service to self as well, as they too had an agenda. At this point David chimed in regarding the Ra/Yahweh beings from the Law of One. He told of how they said during these channelings that they could not ascend from 6th to 7th density until they assisted in our ascension on Earth. Here is what the Law of One says about this motivation. This Ra group consciousness desires to help us achieve 4th density ascension, and is completely open with the fact that they desire to achieve 7th density. In these efforts, they work exclusively with Earth until this goal is achieved. I believe it was this point when Corey added that in a way, we as humans on Earth were holding them back from their own ascension like a parachute, and that these Guardians could not ascend until everyone on Earth arrived at 4th density. David added that, according to the Law of One, this was karmic recompense for building the pyramids and exposing the Earth humans to technology that would eventually be used for negative purposes. (This is another key factor of congruence between the Sphere beings and the Ra beings behind the Law of One.) Here is what the text says with regard to the pyramids. 2.2 Questioner: Could you tell us something of your historical background, your earlier times in the illusion and the time state[?] contact, possibly your incarnation on this planet that you spoke of before, and contact with earlier races on this planet? Then we would have something to start with in writing this book. At this point Corey and David discussed the spiritual level of the Inner Earth people, and that they were most-likely 4th density in Law-of-One terms. Wilcock also mentioned that the Law of One text says that the law of karma is 100 times more potent in our 3rd density state than in 4th density. Though it does still exist. It would seem that this is why those of this Inner Earth group don't believe in karma because it is so far removed from their conscious awareness. Here is what the Law of One text says on karma. So according to the Law of One, the distortions within the 3rd density are approximately one hundred times more potent than in the other densities. This would include karma. Corey continued his account. He was lead through a large area with hundreds of people reclining in egg-shaped chairs. This room was completely silent. This room was actually used as a communications room for telepathic connection with people on the surface. When people on the surface reach out with their minds to connect with other beings, many times they end up connecting with these Inner Earth workers. According to Corey's account, these people often pretended to be extra terrestrials, ascended masters, or even personalities and icons from various religious belief systems. As Corey was told by the priestess, these people use this telepathic deception to protect themselves from discovery. They felt that if they didn't, their Inner-Earth realm may be subject to possible attack. At the same time, these people seek to help the surface population undo thousands of years of programming and to change society as a whole for the better. They use this telepathy in order to achieve this assistance. They may induced visions via telepathy, or have telepathic, group conferences for viewing library texts or other information. Overall, these Inner Earth workers see this deception as a positive thing, as they are helping the surface population while protecting themselves. Corey continued his account. The tour led to the bottom floor, where there was a large, spherical room. This room was temperature-regulated, and was basically a clean room. Inside was a crystal that the Inner Earthers were trying to grow. There were people telepathically interfacing with it and attempting to draw information from it. It was at this point that Corey learned how important his experience was to them, as certain crystals seemed to hold some type of wisdom that they desired. 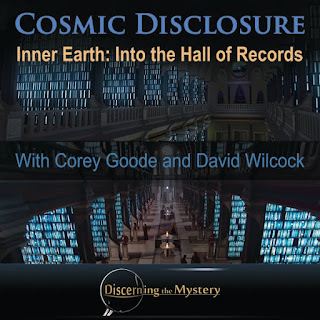 The Inner Earth people acted as though they didn't need the help of “surface people” for anything besides Corey's knowledge, but it became obvious that this was untrue seeing as Corey was their only contact between themselves and the sphere beings. So there was another agenda to be addressed. Corey was then taken back to the cleansing room where he was, again, thoroughly embarrassed in the cleansing ceremony. After this cleansing, he said his goodbyes, and was then teleported back to his living room. He said that there was a time dilation effect in his teleportation. He recalled being gone for what seemed like an extremely long period of time, but when he got back, it was as though only a fraction of that time had passed. Upon his return home, he recounted having greater telepathic contact and intuitive ability with those around him, and surmised that his mind meld experience must have had an unexpected effect on him psychically. 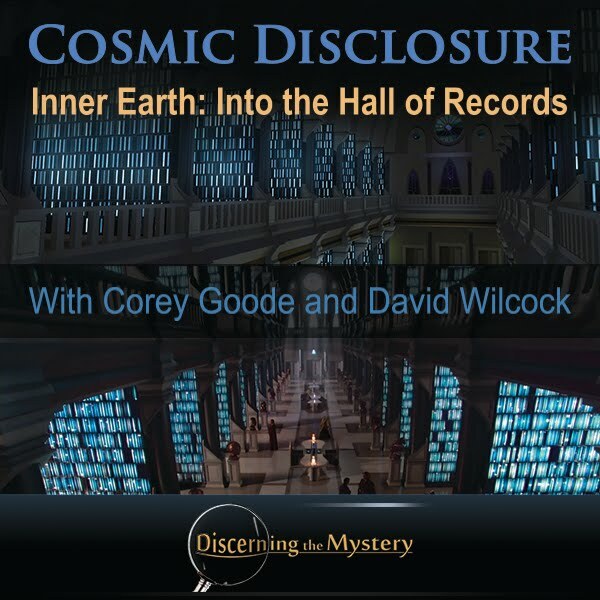 Click here to watch this week's episode, “Cosmic Disclosure: Inner Earth: Into the Hall of Records”.